In Case of Emergency (ICE) Stickers can be placed on your helmet or other belongings. 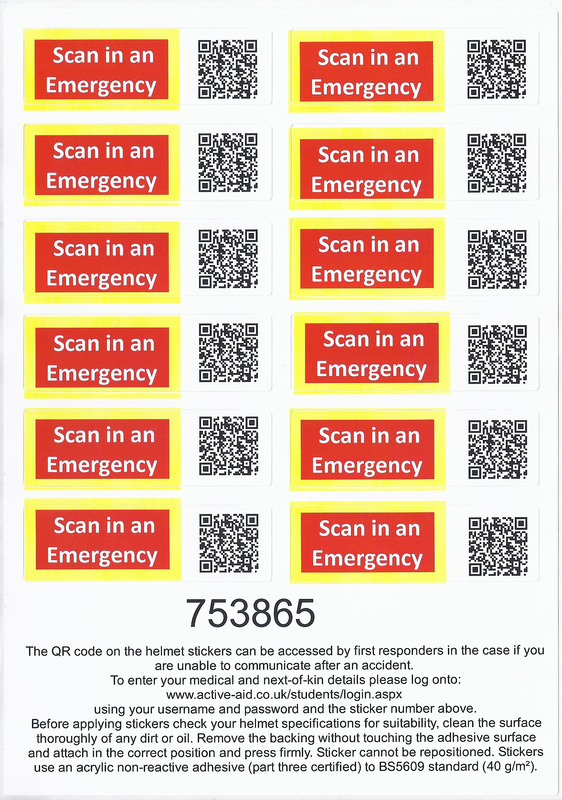 The stickers contain a QR code which can be scanned by emergency responders to display emergency contact details and personal information on a web page at the Active Aid website. A one year subscription is available for £3.00. If you have attended a course with First Aid Cumbria and have a current first aid certificate then please contact admin@firstaidcumbria.co.uk as you may be eligible for a free sheet of stickers. Sample ICE sticker. Scanning the above sticker will take you to this sample ICE details page. Use the BUY NOW button to purchase a one year subscription for £3.00. After making your purchase you will receive a sheet of stickers in the post. You will also receive an email with a username and password for the Active Aid website. 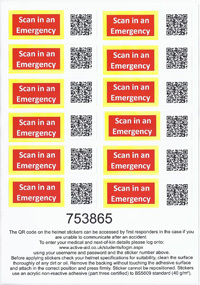 Once you receive your stickers log in to the Active Aid website and enter your ICE sticker details. You just need to enter your sticker number and as many contact or personal details as you wish. NB: Your ICE data is stored encrypted in our database. It can only be edited by you but could be seen by anyone who scans the QR code on your ICE sticker. If you have any information that you would not want a member of the public to see then do not enter it. The data you enter will not be shared with any other organisation or used for any purpose other than to provide your ICE details. At the end of your subscription period you will receive an email reminding you to renew your subscription.